There are very few women who are naturally slim and experience no weight or shape issues after 60. For most of us the nasty truth began to dawn already around 40. It was no longer so easy to maintain our weight at the level we liked it best. Now at 60 we understand the reasons and think we know the solutions but somehow it isn’t working. The scales are showing a little more each year and the next dress size is looming! Just in case we have missed something here are the facts again as I see them. Metabolism ~ Our metabolism (the rate at which our body burns calories) begins to slow down at 30 so by the time we reach 60 it really needs some help. The only way to raise the metabolic rate is exercise – almost any kind. Muscle Mass ~ The Bulk of muscle reduces and weakens as we get older especially without exercise. Hence poor posture and problem zones like upper arms, inner thighs etc. As muscle actually burns more calories than fat the decrease in muscle tissue exacerbates the weight problem. Bone tissue ~ Bone density decreases and bones become weaker. With exercise, healthy food choices and some simple weight bearing exercise it may be possible to stave off Osteoporosis. Lack of Energy ~ This is a chicken or egg story.. We feel tired and lethargic so we eat, often the wrong foods. This causes huge peaks and troughs in blood sugar levels leaving us tired. We put off the exercise until tomorrow or next week or whenever. Through lack of exercise the metabolism slows down even more and we feel tired and hungry for something sweet or baked and here come the next high to low energy swings! No one need become a marathon runner! The Fitness Training Plan is all about a measure of exercise on a regular basis. Just a short walk every day is a good start! We don’t need to suffer on the food side either. At our age diets have to be a thing of the past. 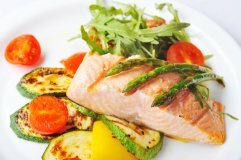 We can choose a high energy diet for vitality and gradual weightloss. Choosing healthy breakfast foods is a good place to start your fitness plan! No food need be eliminated 80% / 20% is an achievable goal. to motivate you and monitor your success! Our goal is not to get skinny but to achieve a healthy, preferred weight, a fit and toned body and enjoy bags of energy and vitality. A Choice ~ You Decide! The way I see it we have a choice. We can take it easy and put our feet up, endure the gradual weightgain and miss out on lots of activities because we’re not flink enough. We can enjoy all the naughty goodies of course all of the time but as time goes by lack of confidence and discontent just add to the perceived miseries of getting older. I still want to travel as far and as much as possible. I want to take part in all sorts of nonsense events with my two grand daughters and I want to stay healthy. I have an invitation to a Summer Wedding in a Chateau in France and I’m looking forward to choosing something really special to wear. If we are honest we enjoy all these occasions so much more when we are confident about the way we look and feel. The simple Eat Smart Move More strategy can easily become a Lifestyle. To help you get started and keep you motivated until that happens we are doing it together. The Free Back To Fitness Challenge began in January, you can get the eat yourself slim updates here on my Anti Aging Blog or join us on the My Anti Aging in Action Facebook page. On Facebook we can chat about our progress get tips and inspiration from each other and learn how to eat smart move more! Breakfast Smoothie Recipe for Older Beginners!